Moose are diffi­cult for drivers to see because of their dark coloration and those long legs that raise moose eye-shine above automobile headlight level. On high-speed state high­ways, these factors result in very short detection distances for drivers when moose cross roadways. Those long legs combined with a large body mass create another hazard: cars often take the legs out from under a moose, causing the main mass of the animal to come crash­ing through the windshield of the car. The lack of warning combined with the nature of these accidents often results in devastating damage to the vehicle and serious injury or fatality to the driver and any passengers. There have been three human fatalities in Massachusetts involving moose-vehicle accidents that occurred in 2003, 2007, and 2012, and over 60 serious injuries. 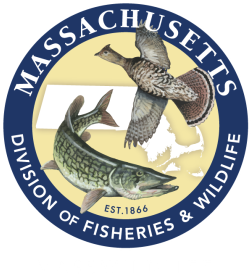 To improve public safety and driver awareness of moose, MassWildlife and MassDOT took advantage of recent research by Dave Wattles and Steve DeStefano of the USGS Massachusetts Cooperative Fish and Wildlife Research Unit. They inves­tigated moose movements and habitat use in Massachusetts by capturing moose, fitting them with GPS collars, and tracking their movements over time. MassWildlife’s Deer and Moose Project Leader David Stainbrook also has a collection of reported moose vehicle collisions, providing location and other useful information. Using all of this information, biologists identified moose-crossing hotspots along routes 2 and 202 and other corridors where moose habitat use and collisions were highest. New permanent moose crossing signs were installed by Mass-DOT and mobile LED message signs will be deployed during the September through November rut (breeding season) when moose are more active. The signs are meant to alert drivers to slow down. Although DOT signage is only placed along the documented moose crossing hotspots, moose are crossing roads over much of central and western Massachu­setts. Drive slowly and be on the look-out from dusk till dawn, especially in the fall when the rut is in full swing. Always wear your seatbelt, and if you see a deer or moose crossing the road, hit the brakes and try not to swerve off the road. Among all forms of wildlife, turtles are one of the most negatively affected by roads. They are relatively slow moving and often have delayed reactions to motor vehicles on roadways. The life history strategies of freshwater turtles make them susceptible to the negative effects of roads. Terrestrial movements of turtles include female migrations to nesting sites, dispersal of juveniles, movements among habitat patches, movement to escape unfavorable conditions, and movement of males to find mates. Semi-terrestrial turtles such as the spotted (Clemmys guttata) and Blanding’s (Emydoidea blandingii) turtles utilize a matrix of several, often small, wetland and upland habitats. Overland migrations to these sites are often impeded by roadways, complicating their migrations. These movements across the landscape can lead to road-associated injury and mortality. 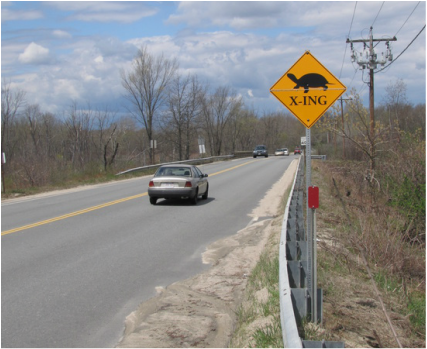 Additive mortality due to roadways can lead to the decline of local turtle populations. Additive mortality of 2-3%, representative of rates caused by vehicle collisions, often leads to negative population growth rates for freshwater turtles. These levels of additive mortality are representative of what populations are experiencing along roadways in Massachusetts. In an effort to support the Northeast Blanding’s Turtle Working Group (recipient of a USFWS Competitive State Wildlife Grant), LLMW installed turtle crossing signs at Blanding’s turtle road crossing hotspots throughout the commonwealth. The results of our road mortality surveys directly entered into the state’s hotspot analysis.